Hey, folks! I’m taking a little break this week. I’ve basically gone a solid year without missing an update, so I decided to take a very short break and focus on my family this holiday. The comic will be back on track come Friday! As for today’s piece, this was my Collective of Heroes Secret Santa gift art from Doug Curtis of The Flying Ferret. It’s a fantastic superhero parody comic in the style of The Tick, and it’s been going strong since 2005! The Flying Ferret is this week’s Comic of the Week, and I highly recommend reading this one from the beginning! 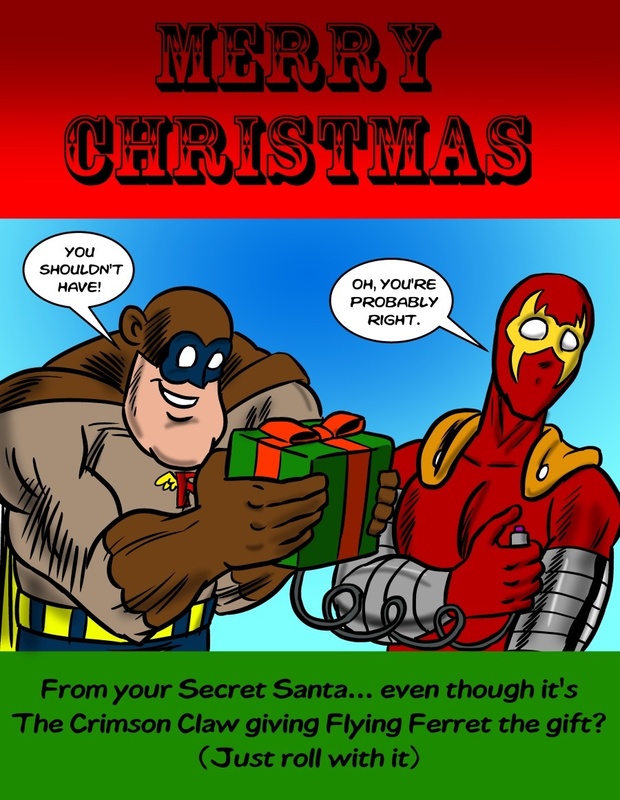 You can leave comments by clicking here, leave a trackback at http://supervillainous.spiderforest.com/comic/featured-comic-the-flying-ferret-by-doug-curtis/trackback/ or subscibe to the RSS Comments Feed for this post. That better be a claymore mine or shaped charge in there Claw, or you could be biting the dust with that ferret. Naaaah. It’s just a custard pie to the face. Though the custard is made of acid. And there might be some venomous insects inside that are also acidic. The pie crust might have some acid too. He’s losing that chin, is what I’m saying. This pastry has “siege engine disposition” written all over it. holy crap this is an awesome comic. I just read the entire thing in one night which i’m kind of regretting because now I really want to find out what happens next but its going to be awhile. Anyway great job man and keep it up. Oh I also hope your friend Mikko is okay. You read all of Flying Ferret? Thanks! You made my day. Thanks for the plug, Zappit!